Experience the energy of NOLA like never before with a stay at New Orleans Marriott. Our award-winning hotel is located on Canal Street, steps away from the legendary French Quarter and an easy stroll from landmarks and attractions including Jackson Square, Harrah's Casino and the Audubon Aquarium of the Americas. Contemporary rooms and suites provide a home away from home, with amenities including high-speed internet, deluxe bedding, mini-fridges and oversized flat-screen TVs. Many accommodations boast views of Canal Street and the French Quarter, too. 5Fifty5, our signature hotel restaurant, showcases flavorful American fare; 55 Fahrenheit serves shareable plates, complemented by wine and craft cocktails. Additional perks include a modern fitness center and our convenient Canal Street Pantry. If you're hosting an event in New Orleans, you'll be delighted with our versatile venues, as well as our exceptional catering services. 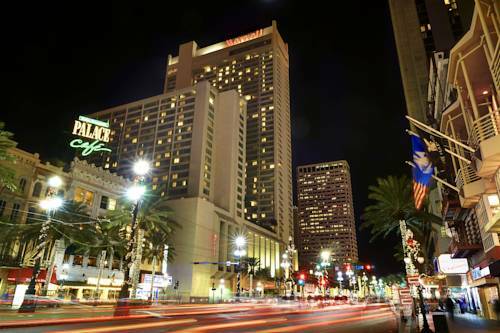 The unique charm of the Big Easy is yours to discover at New Orleans Marriott. 5Fifty5: Named in honor of our address on Canal Street, 5Fifty5 showcases classic Louisiana-style cuisine for breakfast and lunch. Stop by after a busy day in New Orleans to try the restaurant's award-winning gumbo. 55 Fahrenheit: This chic wine bar and restaurant is a wonderful spot for a working lunch or a light dinner with friends before an evening of fun on Bourbon Street. Sample innovative cocktails and shareable plates. Canal Street Pantry: Let s Get Fresh! Grab delicious flavors on the go at Canal St. Pantry including breakfast sandwiches, pastries, salads, home-made pizzas, imported, domestic and local beers, wine and spirits or local favorites such as New Orleans Ice Cream.